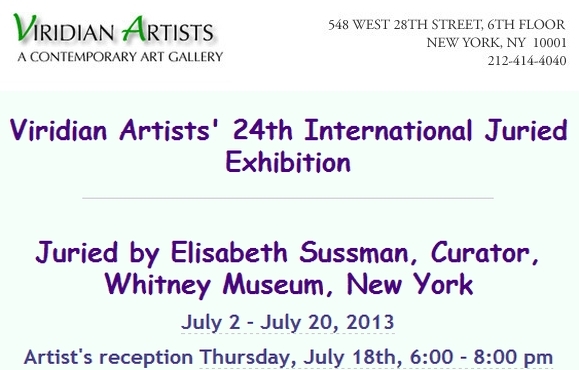 Chelsea: Viridian Artists Inc. is pleased to present their 24th International Juried Exhibition. 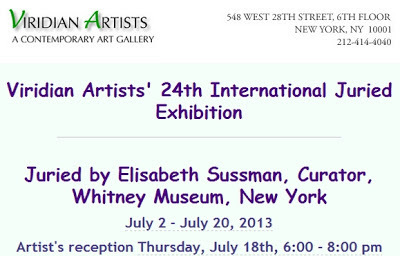 Curated by Elisabeth Sussman, Curator, Whitney Museum, New York, the exhibition opens July 2nd and continues through July 20th, 2013. In celebration, a special reception will be held on Thursday, July 18th 6:00 - 8:00 pm. Artists: Lizz Aston, Ed Herman, Samaray Akarvardar, Jane Alexander-Perry, Ransom Ashley, Bob Augstell, Kathleen Benton, S Brian Berkun, Elizabeth Castonguay, Alexander Churchill, Malika Cosme, Henry Coupe, Barry Goldberg, John Hansen, Edith Hillinger, Aram Han, Timothy Macy, Dana McElroy, Pilar Olaverri, Zoran Poposki, Leonard Rosenfeld, Kimberly Rowe, Seena Sussman, Tore Terrasi, Rebecca Treadwell, Susan Smith Trees, Catherine Vanaria, Andrew Williams. Elisabeth Sussman was recently awarded the sixteenth CCS Bard Award for Curatorial Excellence in recognition for her dynamic curatorial vision and her dedication to the field. She is Curator and Sondra Gilman Curator of Photography at the Whitney Museum of American Art. Most recently, along with co-curator Jay Sanders, she curated the 2012 Whitney Biennial. Viridian's International Juried Exhibitions are a series of exhibitions that serve to encompass a diverse selection of outstanding art from around the world that might not otherwise be seen in New York City. This marks the 24th year that the gallery has offered artists the opportunity to have a major museum curator see a selection of their work.